SharePoint allows you to create a personalized version of a web part page. This means you can add/remove web parts or modify some web part properties that allow personalization changes. So you don’t want your users to be able to personalize pages? Here’s how. Select the web application you want to apply changes (sadly this is changes applies to the full web app). Scroll to the bottom of the list of options and observe the last two. 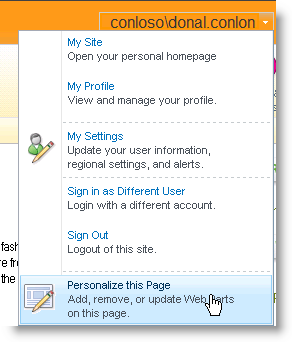 Clear the options “Add/Remove Personal Web Parts” and “Update Personal Web Parts”, to prevent the user personalizing the web part page. Now the user cannot personalize the page! Fun with Filters (User Profile Synchronization). Somebody shoot me now. 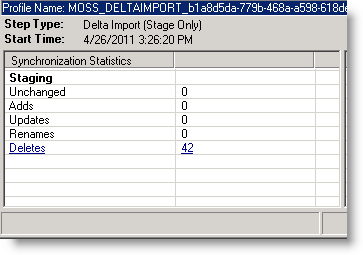 While doing a migration from MOSS 2007 to SPS 2010, I had to import all the existing profiles from the SSP. The steps to this work pretty well, so yay for that. Translated means, only give me users and enabled accounts. Not terribly unusual for a sync connection. See how easy that was? Call your directory guy, ask for a query to filter out disabled accounts and non-users, copy string from email, paste into user filter field. Save. Done. Nice, so lets do that with our User Profile Connection. MOSS 2007 filters were inclusive, i.e you gave it a query that define all users to include in the syncronization. SPS 2010 does the opposite. It makes you pick your containers to sync and then you apply exclusion filters. Either Microsoft decided LDAP queries were to much for SharePoint folk to handle, or they really like trees, or something, but now you have to use an interface to build out your query. So you create your new connection by specifying your source details (in this case AD forest, and sync account details. Then you populate a shiny tree in a box that represents your directory objects. That was such an efficient experience, and only took me 3 cups of coffee. CRAP!#! I just clicked the “select all” (conveniently located close to the ok button), so now I have to do it all again. Can’t wait until I have to do this in production where I have several containers I want to select. Well, we have our connection defined, time to add some filters to it. Lets do the same as before, no disabled accounts and only users as defined by objectClass or objectCategory. userAccountControl bit on equals 2. No problem. 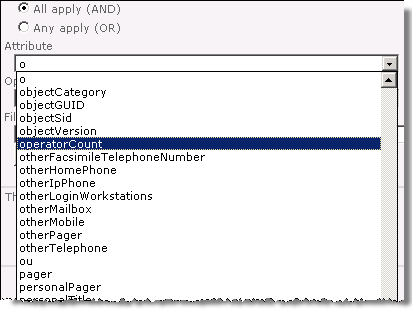 Select userAccountControl from the Attribute list, and wait for it to post back to get the applicable operators….. and wait…. (coz it ain’t that fast). Great, I set bit on equals 2 and click Add. ok, we have our first exclusion filter. No problem there, and if that’s the only filter you’d be golden. But we want more. Let’s exclude accounts that are not objectClass equals user. Looks like there isn’t one. Even though there is. Moving onto the objectCategory attribute, which is there. Crap. I forgot to select OR instead of AND for the operator. Now I have to delete (wait), and re-add (wait). Ok, lets go with these two filters for now and save them. Make of that what you will, but it basically means we cannot use the objectCategory attribute for filtering (fix coming in SP1 or beyond apparently). The only way I could get profiles migrated was to only use the disable accounts property. So another thing I tried is I ran a successful import (only excluding disabled accounts), and got 42 profiles back. So lets try adding a filter that excludes users that do not have an email address (mail not equals *). FIM shows my deletions ok. So that’s promising (even though all these accounts do have an email address ). So I go back to my user profiles page, and I expect to see a count of 0. Except I don’t. I see there are still 42 profiles there. Huh? Lets search to see who’s still there. And there you have it, 42 profiles and none of them visible. So are they there or not? I’m so done with this, I really don’t care at this point. 5. What’s my query again? So lets go back and check my query,as in what containers I selected and what filters I have applied. Are you kidding me? I have to reconnect to the source, populate the tree, then navigate all the way down to see what’s selected? So I was trying to migrate the user profile database (not migrate as much as move to a different drive). In order to do that I wanted to stop all services that may be interacting with the databases, the sync service being one of them. After a quick Bingle, I come across a post by Chaitu Madala. The issue is related to the file system cache. Clearing this cache resolves the issue. There is a kb article at Microsoft support that step you through it for WSS 3.0. 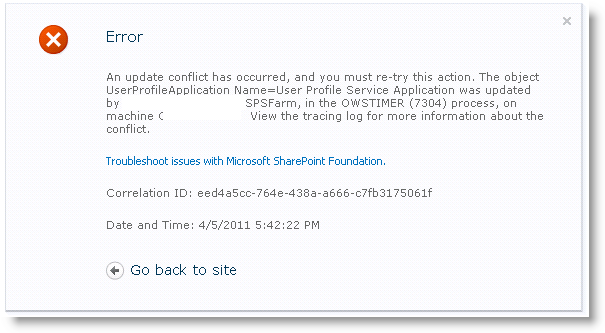 Same steps apply for SharePoint 2010. 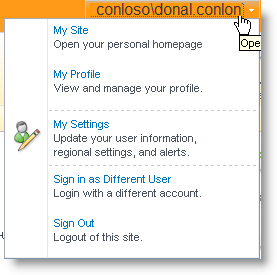 On the computer that is running Microsoft Office SharePoint Server 2007 and on which the Central Administration site is hosted, click Start, click Run, type explorer, and then press ENTER. The Drive placeholder specifies the letter of the drive on which Windows is installed. By default, Windows is installed on drive C.
The GUID placeholder specifies the GUID folder. In the Advanced settings list, click Show hidden files and folders under Hidden files and folders, and then click OK. Type 1, and then click Save on the File menu. Note, I was unable to verify the last step as the file was in use and unreadable using an editor. But I was able to stop the sync service successfully after clearing the file system cache.